This trip went to many places not visited by foreign tourists and I felt I got to see the real India, good and bad, not just tourist destinations, which was a good thing. Explore the vintage monuments and streets of this former capital of the British Era, also visit Missionaries' of Charity the noble peace prize winner, Mother Teresa’s house and final resting place.. Opt to take a ferry ride across the Hooghly River. Opt to join the group for dinner at one of the famed restaurants on Park Street for the final night out. Only ground transport Train (seats), train (beds), private van, walking, plane. TRAINS The best way to see India is at ground level on the railway system. In fact, no visit to India would be complete without the experience of tavelling on a train and negotiating the busy railway stations. The chaos in the Indian Railway stations is a replica of the life in India. Indian trains are not merely a conveyance they are an odyssey so sit back relax, be patient and enjoy the show. 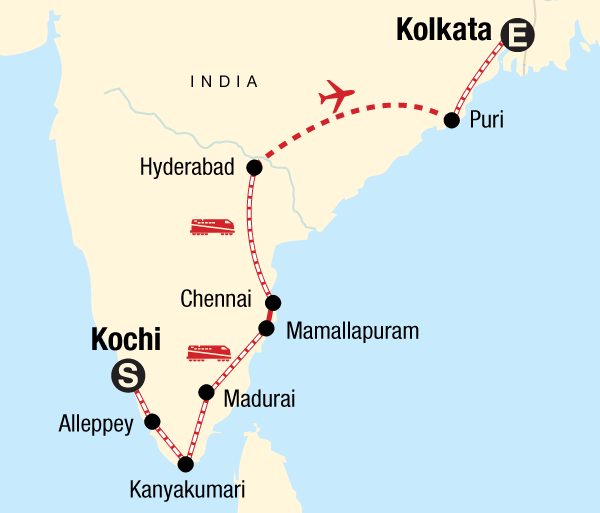 G Adventures uses a combination of AC 2 tier, AC 3 tier and sleeper class (for overnight journeys) and AC Chair car or second class seats for day journeys. Indian railways operate with a centralized reservation system. This means that G Adventures cannot control how seats are assigned within a class. Despite our requests to seat the entire group together, often times seats are spread out in the coach or throughout different coaches. 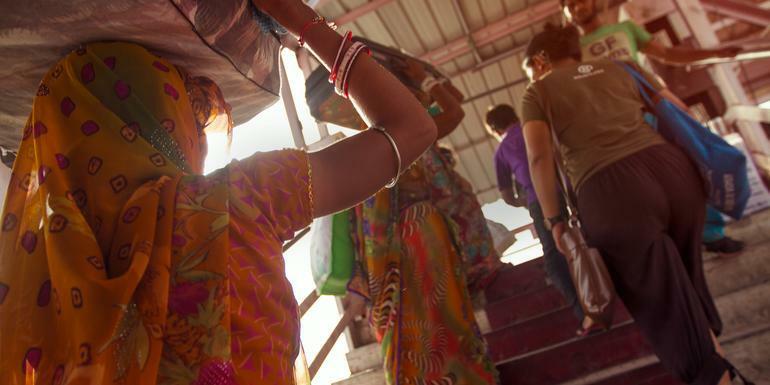 This is all part of the adventure that is travelling India by rail. Take advantage of the opportunity to chat with locals and remember you always have the support of your CEO. There are no restaurant or buffet cars on Indian Railways, but on long distance trains an attendant will appear in your coach and ask you if you would like to order food. Regular stops are made at stations where food is also available and on some trains many vendors board the train selling chai, cold drinks and crisps and biscuits. Don't expect pristine western standards anywhere in India, but you'll find AC2, AC3 and AC Chair class fairly clean by Indian standards, with both western-style and squat toilets usually in a reasonably sanitary condition. Sleeper Class and 2nd class toilets may be a different matter! Bring your own toilet paper and hand wash soap or antibacterial lotion. Indian trains are quite safe to travel on, even for families or women travelling alone, and you are unlikely to have any problems. Having said that, theft of luggage, although rare is not unheard of, so just for peace of mind you might like to take along a chain and padlock to secure your bags (readily available at all Indian stations). Generally, Indian Railways are very efficient, but Indian trains do run late particularly in winter time when fog is heavy, and sometimes it's hours rather than minutes. Make sure you have something to occupy your time – a good book, music, a magazine or photos of your home country and family to show the Indian travellers also waiting for the train. You should also have snacks and water for the journey. Please note that you MUST be comfortable carrying your own luggage, as there will be a lot of up and down stairs on this trip due to the size and layout of train stations in India. Most often, you will not have access to escalators or elevators. You will also be required to carry your luggage short distances between transport start or end points and hotels. ROAD Traveling by road in India is certainly not what people are use to in Western countries. Rules are not always followed, drivers appear to speed, do not stay in their lanes, overtake in seemingly dangerous situations, rarely use their mirrors or driving lights at night time. The horn however is used very frequently and can range from the latest Bollywood tune to Britney Spears! In India, although the government is investing large sums of money improving the road infrastructure, there is a lot more to be done. As a result, in India, some of the roads are poorly maintained, pot holed and uneven. This gets even more pronounced particularly during and after the monsoon. Travel time covering relatively short distances is very long in comparison to Western countries.